2010 was a good year for Día. Almost 300 libraries, both public and school libraries, registered their celebrations with ALSC. 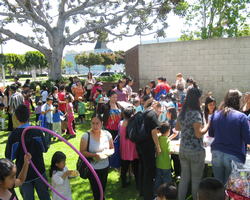 Celebration activities included both parents and grandparents, along with their children. Libraries held events in their libraries, in near-by parks, and even held a tailgate patry that featured like-minded community organizations. All joined in the celebration of literacy for all families in every community.